Acclaimed Disney expert Jim Korkis tells the stories of what Walt did right, what he did wrong, and how you can follow in his footsteps. 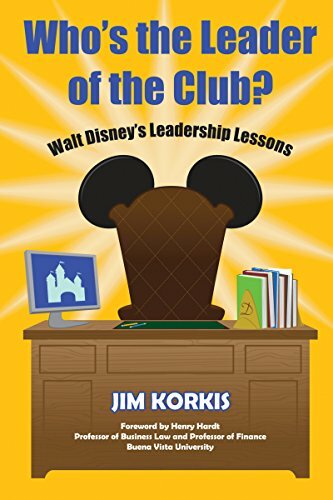 Drawing upon his unparalleled knowledge of the Disney Company and its legacy, Korkis distills the essence of Walt Disney's leadership principles into an exciting narrative of popular history and self-help. You'll read not just about what Walt did but why he did it, and how you can apply the lessons to your own life or your own enterprise. Who's the Leader of the Club? will teach you how to lead like Walt. You don't have to be producing animated films or running theme parks to benefit from the innovative but common-sense approaches Walt Disney took to every challenge. In just a few hours, you'll learn what it took Walt a lifetime to perfect, and you'll learn how to put it to work for you. Just as important, Korkis will teach you how not to lead like Walt. No leader is perfect, and Walt had traits that cost him, such as his berating employees in public, never praising an employee for good work, and trying to get the best out of people by pitting them against one another. Despite these flaws, Walt inspired great personal loyalty and devotion. Korkis explains why. Do you know your story? Walt Disney's success was built on stories and storytelling: not just fairy tales about princesses and dwarfs, but knowing how to communicate so vividly and so compellingly that others want your story to come true, and will help you make it come true. But first you have to know your story, and then you have to learn how to tell it. Packed with lessons, anecdotes, and quotes, Who's the Leader of the Club? comes with all you need to master the Disney way, start telling your story, and become the leader of your club.